The past couple of episodes have been rough, but this week, Agents of S.H.I.E.L.D. is back with a time-bending episode. ("Monsters and magic and nothing we were ever trained for," am I right?) How will this go down? Let's find out! The episode begins with a homeless man working on a bird carving. The owner of the building he’s behind comes out and tells the homeless man--Charles--that he needs him to clear out before his store opens. The store owner tells him that there’s a shelter over on 9th, and Charles starts packing up. Taking pity on him, the store owner holds out some money for Charles to take. Charles protests, but the store owner insists and hands him the dollar bills. When they make contact, the store owner freezes and starts pleading for Daisy to come help him. After the opening credits, we discover that S.H.I.E.L.D. monitors 9-1-1 calls. A caller asks specifically for Daisy Johnson because Hydra is coming to attack him. We discover that it’s the store owner, whose name is Edwin Abbott. Daisy has no idea who he is, but S.H.I.E.L.D. assembles to go help him anyway. Due to Mack being on bed-rest, Coulson decides to come along. It's been a while since he's been in the field. S.H.I.E.L.D. The ATCU lands in New York and arrives at the scene, where Edwin recognizes Daisy immediately. She asks how he knew her name, and Edwin says he had a vision of this exact moment. He’s convinced Charles put a curse on him. Coulson goes to talk to Charles, and Daisy asks Edwin how he knew that Hydra was coming. A bullet hits him in the shoulder, and he dies. He meets Malick for dinner and thanks Malick for bringing him back, but he also wants to know why Malick brought him back. Malick explains that he and his ancestors believed that if they could bring Hive back, they would be rewarded. That reward would be that Hive and Malick both get to take over the world. Hive is skeptical, bringing up the fact that Malick has a great amount of money and therefore a great amount of influence. He wants to know what he could possibly give Malick. Malick says he’s surrendered his life to a higher power, and Hive zeroes in on the word power. That’s what Malick seeks: true power. Men with suits walk in, bringing Charles, and Hive says it’s time to go above ground. He pulls Coulson’s prosthetic arm out of the pockets of his robe (which must really have HUGE pockets) and sets it on the table, saying it’s time to show Malick what true power looks like. Malick, naturally, seems unnerved. Back at S.H.I.E.L.D. HQ, Daisy has explained her vision to the team, and it turns out that Coulson was actually shooting her. Coulson asks if it’s even possible to have futuristic visions, and everyone chimes in with their opinion. After establishing it is, indeed, possible, they try to establish a plan. 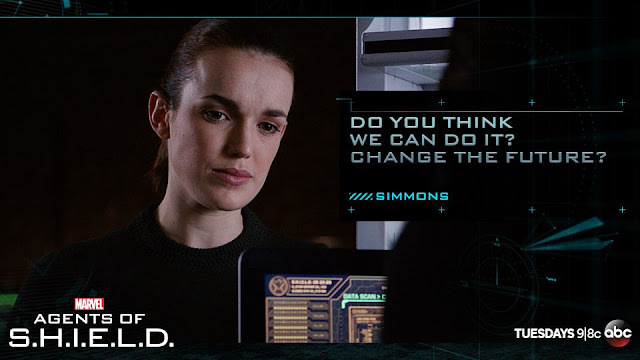 Daisy wants to reverse engineer the visions and try to stop them, and Coulson tries to put that plan into action, but Fitz says that isn’t scientifically possible. Using a stack of paper, he explains that the past and the future are fixed and there’s no way of changing it. Despite Fitz’s clever explanation, Coulson still doesn’t believe him. He decides that the only way to prevent the visions from coming true is to keep Daisy from leaving the base, since she was the central point of each of the visions. He’s going to send May instead. Daisy isn’t happy about this at all, but Coulson stands firm. He tasks Daisy with remembering every detail that she can. He says he and Lincoln will chase down Intel on the homeless man (hey, since Lincoln appeared in Daisy’s visions, shouldn’t he stay behind too?). Then he’ll send May out to take care of the mission. In Coulson’s office, he and Lincoln discuss how weird this all is. Coulson references Terminator, and Lincoln says he’s never seen the original Terminator. Lincoln's innermost thoughts were probably something like this. In addition to chuckling awkwardly at Coulson's joke, Lincoln is weirded out by all this, especially the fact that they only knew to try to save Edwin because he heard Daisy’s name when they went to try to save him. He thinks that this happened for a reason. Their facial recognition screen dings and has come up with a match for Charles the homeless man--his name is Charles Hinton, who was actually a real scientist who went over theories related to mathematics and space-time. (Well-played, Marvel. I see what you did there.) They send a team to Charles’ last-known address, and Lincoln tells Coulson he should worry more about himself than Lincoln. I'm so sorry. I've looked for Daisy/Lincoln chemistry, and I've tried so hard to like them. I want to believe. Daisy tries to recall more information about her vision, and she indicates that there’s a rooftop with a flashing billboard. She wishes she could remember more clearly since they’re probably taking Charles there now. True to her word, Hive and his men pull up in front of a tall building with a billboard on the roof. Daisy says she feels like it happens tonight. Jemma goes over to May and asks if she thinks they can change the future. May says every move we make does, but the real feat would be changing the past. A S.H.I.E.L.D. team walks past the glass doors, and Daisy recognizes one of them: the woman crying in her vision. She confronts the woman. It’s revealed that the woman is Charles’s wife, and Charles walked out on his wife and eighteen-month-old daughter in July. Daisy talks to his wife, who tells her about the day that Charles underwent Terrigenesis. She held his hand, and they both saw flashes of the future which ended in a horrific car crash... then later, they saw her mother in a hospital bed. This happened anytime Charles touched anyone, and he and his wife had to stop physical contact. Whenever Charles would touch someone, he and that person would see someone’s death. He tried to stop said deaths over and over, but it didn’t work, and eventually, his wife thinks, it sent him over the edge. Daisy asks if there’s any information the wife can give to help them and also asks about the bird Charles carved. Daisy thinks it was a robin, and the wife says that their daughter’s name is Robin. Ultimately, Charles left his family because he’d never be able to touch his daughter again. Charles’ wife starts to cry, causing the first part of Daisy’s vision to come true. Malick and Hive take the prosthetic to the company that made it. Because of their advances in technology, Malick would like to buy the company. The owner of the company refuses, but then they bring Charles in, who apologizes and touches the hand of the CEO. He has a vision of Hive pulling the flesh in particles off of his employees’ faces. Badly shaken, the CEO agrees to sell his company, then begs Hive and Malick to leave. And then he causes Charles’ vision to come true, killing the men. We see their charred skeletons as Malick and Hive’s people take over the building. They’re given the special piece of tech, some body armor, that was developed by the company. Hive tells Malick to put it on so he can experience unlimited true power. It's all very futuristic. May finds Daisy, who’s still upset she’s not going. She says she has an advantage over May--she knows what’s coming. She only got to Charles a few seconds too late. So, May tells Daisy to show her. They set up a room just like the scenario in Daisy’s vision to have May practice. After Coulson tells a team member to buy something nice for Charles’ daughter, he overhears what’s going on and helps time May as she goes through the scenario, battling Lincoln, Fitz, Simmons, and some guy named Doug. When they’re finished, Daisy isn’t happy and wishes May had her Quake powers. They reset for another go. Hive tells Malick that in order to feel true power, he should crush a human: the CEO. As Malick wrestles with this decision, Hive monologues about how it feels to drain a human’s life--the same powerful feeling that Coulson felt when he killed Ward. The CEO punches Malick and tries to get away, but Malick takes the CEO’s head in his hands and squeezes it, crushing it. Fitzsimmons discuss how Fitz is sure May isn’t going, since the future is unchangeable. Jemma disagrees, saying she refuses to believe anything is completely inevitable. Fitz says they’ll see. May runs through the scene again, and Daisy is happy with what she sees. It’s good timing because one of Coulson’s other, nameless agents knocks on the door and announces that they’ve found the building. The team makes the connection between the building and the fact that the company’s nerve wiring was put in Coulson’s hand. They then go over the building schematics and formulate a plan which includes not using radios to communicate since Hydra will be listening. But before they can finish, an alarm sounds that there’s an intruder in the base. That’s when Garner walks in, accompanied by armed S.H.I.E.L.D. guards. He just walked in and surrendered himself. May asks why, and he explains that Lash is taking over. He’s about to turn for the last time... so he’s here to say goodbye. Because of this, Coulson decides that May shouldn’t go on the mission since she needs to be with Garner. Daisy volunteers to go instead, much to Coulson’s dismay. She argues that if everyone but her stays behind, they’ll still be altering the outcome. (Mm... not sure about that.) Coulson reluctantly agrees to let her go, and he tells her to come home. May walks in to talk to Andrew, who has an IV containing Simmons’ experimental vaccine. Garner explains that there’s a little bit of the monster in him and there’s a little bit of him in the monster. He says that when he turns this time, he’s afraid that he’ll be gone forever. He wants this monster in S.H.I.E.L.D.’s hands because he feels like his actions, though wrong, were for an important reason that they don’t understand yet. S.H.I.E.L.D. might need Lash. In Coulson’s office, they’ve tapped into the building’s security cameras. They catch a glimpse of Giyera. Coulson says that even Lash thinks he was serving a higher purpose, and Lincoln says that maybe Daisy and Charles were brought together for a reason. Then Coulson says that maybe they’re all crazy and none of this will make sense. Before he can fully finish his thought, though, they catch a quick glimpse of Hive on the security cameras, which gives them all pause and intense concern. May wishes that she could change the past because every bad thing that’s happened to Andrew could have been avoided if she’d never met him. Garner says he wouldn’t change a thing, but May says she would. Garner says she’s still the center of some of the best moments in his life and that being with her right now is exactly where he’s supposed to be. Daisy steels herself before going in the room and fighting all the men just like the scenario they put May in earlier. She successfully takes them all down and stops the man from pulling the alarm, but the alarm still goes off anyway. Daisy realizes that there’s a one-way mirror in the room. 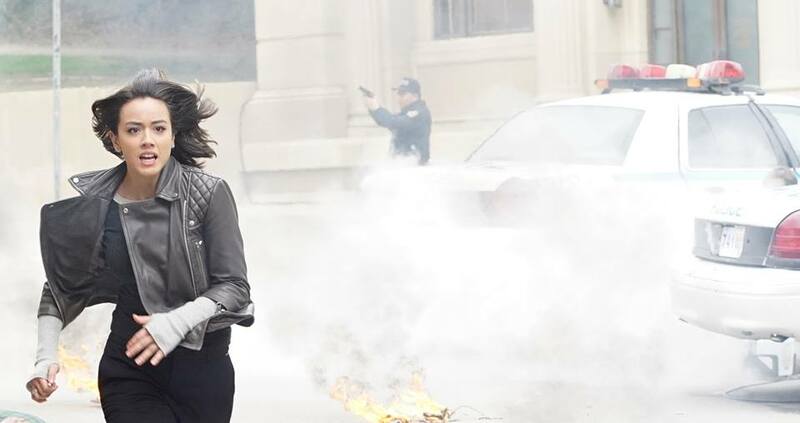 In the reflection, she sees Coulson appear with a gun in his hand, and he fires. Instead of shooting Daisy, though, he’s shooting the mirror and killing the person behind it. They had been monitoring the security feed and realized she needed backup. Coulson informs Daisy that they’re taking Charles up to the roof right now. Daisy asks what Coulson’s going to do. Speaking of, Hive and Giyera walk through the halls discussing how to evade S.H.I.E.L.D., and Hive orders Giyera to kill any human S.H.I.E.L.D. agents. (Yep, that’s just about all of them.) Lincoln goes inside and helps Coulson with his manhunt for Ward (yet another manhunt...). Fitzsimmons stay outside, and there’s not a cloud in the sky. Fitz begins to doubt if Daisy really saw the future. Daisy reaches the roof where she sees Charles preparing to get on a helicopter. Suddenly, she’s knocked out by someone--it’s Gideon Malick 2.0, the kinda-cyborg version!!! He knocks her down and they fight. Daisy uses her powers to short out the billboard, which makes it catch on fire. Lincoln rounds a corner and gets knocked in the head by a fire extinguisher by Giyera. Back on base, Garner runs into the containment module, and he and May touch hands through the glass. Malick gets the upper hand against Daisy, making typically-evil comments about power. On the ground, Fitz can’t get in touch with Coulson. (I thought we said no radio communications?) At the same time, Simmons worries that the death Daisy saw in her vision was her own. Coulson makes contact with Lincoln, who has eyes on Ward, but Coulson has found the charred skeletons and tells Lincoln to not engage. Lincoln has blood covering his face from the fire extinguisher, and he ends up passing out. Garner pulls his hand away from May’s as he transforms into Lash. On the rooftop, Malick lands another blow to Daisy as the fire on the billboard grows. He prepares to kill her, but Charles puts his hand on Malick’s neck, causing him to experience a vision instead. He then turns to Charles and starts to choke him (Hive and Malick really are the latest Sith Lords), but Daisy wakes up and throws Malick away from Charles, breaking his armor and rendering him powerless. Charles falls to the ground, coughing. Daisy says she was sure she was meant to save Charles, but Charles was actually meant to save her. Daisy and Charles are still laying side by side on the building, and Daisy gives him the bird carving. Charles says he couldn’t bear to leave his wife and daughter, but he wanted to protect them from this. Now he’s afraid his daughter will grow up to be like him. He tells Daisy he was hoping she could help and protect his daughter. Daisy promises that she will, always. In his dying moments, she touches his hand, but she gets a vision of the scene from “Bouncing Back”--the one where blood, a cross, and a S.H.I.E.L.D. agent are seen before the ship explodes. He apologizes for showing her this... and then he dies. The bird carving rolls out of his hand as sparks fall from the sky. Hive tells Giyera he wants him to go to a specific place. Giyera thinks that’s where they manufacture the Exo-Skeleton hardware, but Hive says that’s not the technology they’re interested in. 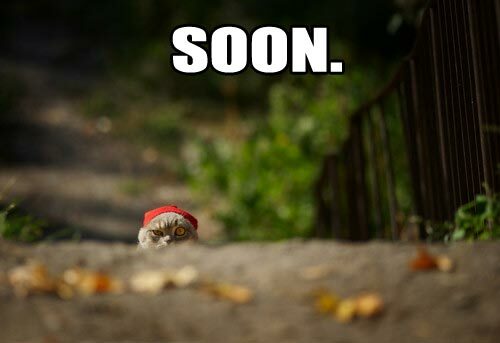 Giyera’s phone rings. It’s Malick, who reminds Giyera that he should be by Malick’s side at all times protecting him. Giyera says no--he’s right where he’s supposed to be. Hive asks about Malick, and Giyera says he sounded... different. We see Malick down some alcohol as Giyera says he sounded afraid. 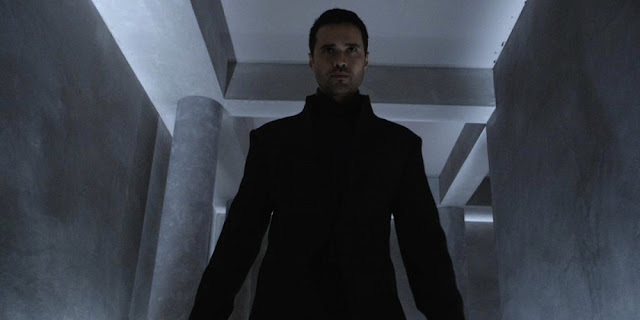 This was actually my first Agents of S.H.I.E.L.D. episode that I’ve loved for a while. Everything about it was masterfully and artfully done, especially the cinematography. It was oddly beautiful, in a way--the symbolism, set design, and artistic choices in this episode were on point. There were solid performance from every cast member, especially Chloe Bennet (Daisy), Ming-Na Wen (May), Blair Underwood (Andrew), and Bjørn Johnson (Charles Hinton). The plot was solid too--intriguing, heartrending, and terrifying. We’ve reached some new territory with Hive’s violence... and Malick’s too. But the thing is, Malick’s now scared of Hive, and I find that such an interesting dynamic. I feel like we're starting to really set the stage for the season finale and a major showdown between our heroes and villains. I know I’ve been a little hard on Daisy lately, but I really liked her in this episode. While I still was annoyed that she went out against everyone’s wishes, it ended up being a good choice in the end. Her last moment with Charles on the rooftop was so touching, and I saw a glimpse of the Daisy/Skye I’ve come to know and love. It was really good that this episode focused so much on her. Though some of the plot was irritating (like Coulson’s doubt of Fitz and some of the logic they used to evade the vision from the future), this was overall a really good episode. In fact, it’s one of my favorites of the season, if not the entire show. Well done, Agents of S.H.I.E.L.D. I look forward to next week. Until we meet again. Have you seen "Spacetime"? What did you think of it?